The unbalanced athlete, motor pattern, team, joint etc…… is not efficient. “In fighting, in evolution, in life, efficiency is the key,” says St-Pierre. This certainly describes most of Georges fights. There were always bigger, faster, meaner, stronger opponents. However, most of his fights went the distance. Eight of his last nine fights went to a five round decision. Now, there are those who will say that he didn’t have the finishing power or submission skills to close fights in the earlier rounds, and that is debatable for sure. However, there is no doubt that anyone’s best fighting attributes will diminish as the rounds progress and fatigue sets in. But, perhaps this is an equalizer when someone doesn’t have one single "golden right hand”, or what have you. Efficiency can be the great equalizer. St-Pierre isn’t your typical fighter. He’s arguably the best mixed martial artist in the world, a 5-foot 11-inch, 190-pound destroyer. Up until his most recent fight with Johnny Hendricks, he had not lost a round in more than 3 years, that is pure efficiency ! Arguably, he is faster than other fighters, he is more fit, has a greater range of skills, has better endurance … in a Darwinian sense, perhaps more efficient ? Here at the Gait Guys we are always considering efficiency. 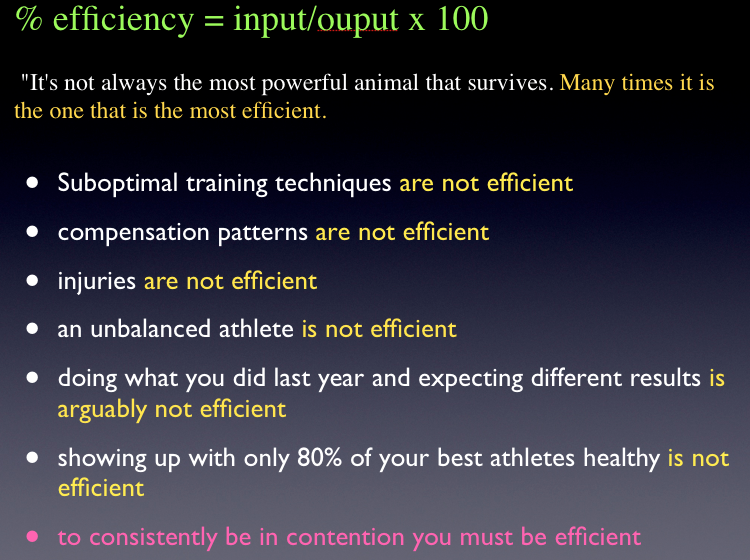 As you can see from the slide above, there are many factors that can diminish efficiency. We strive for as much symmetry as we can because with neuromuscular symmetry efficiency can be maximized. Keep in mind however, that total symmetry is not always possible. Most people have two different feet, often one is more varus because it sat against the mothers rounded belly in utero. And, one tibia is often more bowed or torsioned than the other for the same reason. So, perfect symmetry is not always possible or guaranteed. But, one can do alot to gain as much physical symmetry as possible through detailed study of your client. (Remember, just because things look symmetrical does not mean that they function symmetrically ! This game is not that easy ! But, for some of the uneducated, it may seem to be !) When physical symmetry is regained often the sensory-motor nervous system becomes functionally more symmetrical. And, this is a flippable phenomenon, when neuro symmetry is driven often physical symmetry will be driven in time. Think about the afferent input to the cortex from the peripheral receptors in the skin (Paccinian corpuscles, Merkels discs, etc); the joint mechanorecpetors (types I-IV) and muscle receptors (spindles and Golgi tendon organs). Generally speaking, they travel up the dorsal columns on the back of the spinal cord to the thalamus and then the cortex; up the dorsal spinocerebelllar tract, to the cerebellar hemispheres; the spino- reticular tract to the reticular formation, or in the case of the upper cervical spine, directly into or flocculonodular lobe of the cerebellum. This information needs to be equal and opposite from each side of the extremity (flexors and extensors) as well as the right and left sides of the body. This “Balance” or “Homeostasis” or what the Chinese called Yin and Yang is key to efficiency. In your workouts and rehab, strive for symmetry. We like to say “Tailor your exercises to the weaker side”. This helps to create more equality rather than a larger disparity.